The International Sindh Sammelan at Jakarta held during the last quarter was without any reservations a thoroughly exhilarating and memorable experience. The Jakarta hosts have undoubtedly raised the bar several notches and set a benchmark for the next Sammelan that will not be easy to emulate. I can only use adjectives like “impeccable” and “superlative” to describe the various aspects that went into the making of the event a grand success – be it the hospitality, presentations of papers, F & B arrangements, the entertainment; in short the complete works. And all this came with dollops of sincere and genuine warmth. But as always the case there are invariably two points of view. For some the glass is half empty; whereas for others it is half full. And Sammelans cannot be spared from such polemics. The proclivity to criticize and vilify is unfortunately not uncommon and the usual questioning about the nett results and outcome are invariably raised by a few. I do concede that there is always room for improvement but this should not be construed as a license to deride the bright and positive aspects. Even I myself could suggest a few, but that does not give me any right to deride the laudable efforts of the hosts. I cannot refrain from sharing with you a very interesting occurrence that took place at the breakfast table during one of the days. I was seated at a table with Notan Tolani and Lal Hardasani from Hong Kong, Ram Buxani from Dubai and Ram Jawhrani when we were joined by someone who couldn’t resist pointing out some alleged shortcomings at the Sammelan. The response of Notan was truly remarkable for its simplicity and veracity, yet one that hit the nail right on the head. “Will you ever see the four of us on this table, at any other time of the year, blissfully occupied with our breakfast while sharing our thoughts and exchanging notes on everything under the sun, in such a carefree and leisurely manner? Even when we meet, and the probability of all four together is far-fetched – whether in Mumbai, Dubai or Hong Kong over lunch or dinner – it is always for a duration of time limited by our business, work and other routine engagements. Only at occasions like the Sammelan do we get the opportunity for three whole days to mingle and catch up with old friends, make new friends, share ideas and thoughts – without a care in the world or pressure of time. This in itself is for me a big achievement and gift of the Sammelan” Touché Notan. How true! Three days of constant bombardment of all that is SINDHI. Speaking SINDHI, listening to presentations in SINDHI, gorging on SINDHI food, enjoying SINDHI entertainment, meeting old SINDHI friends, making new SINDHI friends from all over the globe; all without any constraints of time or pressure of work. The camaraderie and bonhomie is truly infectious. Now isn’t all this what is time and again propagated by the chest-beaters lamenting the loss of Sindhyat. Can all this be done for an unbroken stretch of 3 days anywhere else at any other time of the year? To those who say, “Is this all there is to Sammelan then?” I would reply, “Is there anything wrong with this?” I have yet to hear of a delegate asking for a refund at any of the International Sammelans that I have attended. Nobody has been coerced to participate. All delegates pay for their travel, stay and registration – isn’t it? So then what is the hue and cry about? Could it be all about deflated egos perhaps? Why wasn’t I invited and my travel and stay paid for? Why wasn’t I invited to present my paper? 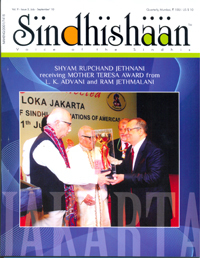 Why wasn’t my contribution to Sindhyat recognized, appreciated and announced? Maybe I’m being a bit harsh but to my mind a great part of any disgruntlement can be attributed to the hurt ego of a few. NEVERTHELESS, as I stated earlier there is undoubtedly always room for improvement and objective and constructive criticism and suggestions should be gracefully received and appreciated with the objective of a more ENJOYABLE AND PRODUCTIVE – NEXT SAMMELAN. I salute Prem Lalvani of the Alliance for his initiative in conceptualizing this event and the likes of Vimla Tewari, Dayal Meshri, Kamal Lala and the many others for keeping this tradition alive. I conclude by wishing all of you a very happy and prosperous Diwali and a productive and enjoyable festive season ahead.